This recipe can make 2 large pizzas or 6-8 individual pizzas. If you are using a new pizza stone prepare it first by washing and drying it thoroughly. Drying can be achieved in a warm but not hot oven. If you don’t have a pizza stone you can use a flat baking sheet pan to bake them on. Preheat your oven to 450°F or 550°F, depending on what your home oven can achieve. Professional pizza ovens can achieve temperatures of 800°F or more. Make sure your oven has achieved the desired temperature before placing a pizza in it. I like to use at least three oven thermometers for that purpose, since they are often faulty. When two thermometers agree, that reading is likely to be correct. Use cornmeal on the bottom of your crust so that it slides easily onto and out of the pizza stone or sheet pan. Be sure to brush the cornmeal off of the stone between pizzas or it will burn and smoke setting off your smoke detector. Placing your pizza directly on the pizza stone will ensure a crispy crust. If you use a baking sheet be sure to use corn meal to prevent sticking. A pizza wheel is convenient for cutting the pizzas, but not necessary. You can use a large sharp knife or long scissors instead. Place all of the dry ingredients except the yeast in a bowl and whisk them together. Add the honey to the warm water making sure it dissolves completely. Stir the yeast into the sweetened water and let rest in a warm place for a few minutes. When it shows signs of life by foaming or bubbling a bit it is ready. Stir the sweetened yeast water into the dry ingredients until they are completely homogeneous. Divide the dough batter as desired into well-oiled covered plastic containers. Refrigerate the dough overnight for 12 to 24 hours. You can also freeze them. After removing them from the freezer you must refrigerate them overnight to raise them again. Let the dough sit out at room temperature for about 10 to 15 minutes before forming your pizza dough or rolling it out to your desired size. On a well-floured surface roll out the dough to your desired thickness. Remember that it will rise to nearly twice the thickness. The thinner the dough is, the crispier it will be. It may also be a bit more difficult to put onto the stone in the oven gracefully. Using a metal pizza peel is the key to this. Before you add any ingredients to the dough, sprinkle it lightly with cornmeal. This will act as ball bearings to help slide the dough onto the pizza stone. Turn the dough over onto the pizza peel or baking sheet. You will use this to place the built pizza onto the stone or rack in the oven. Dress the pizza with all of your favorite ingredients. Brushing the dough with olive oil before your toppings is a great alternative to tomato sauce. A small scattering of sea salt is delicious if your ingredients are fresh and have no salt of their own. Keep in mind that over loading the pizza with ingredients can cause shifting and spilling in the oven. Add fresh herbs after the pizza comes out of the oven. A light brushing of olive oil on the baked crust is a nice touch for both flavor and color. For a delicious luscious breakfast, brunch, lunch, teatime or anytime meal, these scrumptious savory smoked salmon & cream cheese crepes are a splendid solution. Sift together flour and salt in one bowl and set aside. In another larger bowl whisk the eggs until homogenous. Slowly whisk almond milk and warmed honey into eggs until even. Gradually whisk dry ingredients into the wet ingredients. Whisk in the melted coconut oil or butter until the batter is smooth. Let the batter stand for at least 15 minutes before cooking. Heat crepe pan or a very low-sided 8-9 inch skillet on medium. Lightly brush pan in between each crepe with melted coconut oil or butter. When drops of water sizzle lively but not violently in the pan it is ready. Ladle a ¼ cup of batter into the pan, swirling it around so that it is even. Cook 1-2 minutes until the sides lift slightly, then carefully flip the crepe. Cook the crepe on the second side for less than a minute. Stack crepes on a warm plate, keeping them moist by covering with a dishtowel. Do not use plastic or they may wrinkle. Spread 2 tablespoons of cream cheese down the center of each crepe. Divide ½ lb. of smoked salmon slices in to 12 even portions, ~ 1.3 Oz. each. Apply the salmon portion on top of the cream cheese on each crepe. Brush or sprinkle a bit of freshly squeezed lemon juice onto each of the salmon portions. Sprinkle capers evenly onto the salmon. Roll up each filled crepe and plate on a serving platter or onto individual plates. Garnish the crepes with fresh lemon zest. Tip: For a family style meal, serve the makings on individual platters to allow each person to assemble their own crepe to their liking. Add additional condiments such as chopped chives, tarragon, dill, cilantro, chervil and minced red onion. Use your imagination and personal taste, adding ingredients to customize the meal as your own. Frangipani is an almond pastry cream used as a filling in tarts, cakes and pastries. It is usually made of creamed butter and sugar. Eggs are whipped into the creamed mixture then finely ground blanched almonds added. In my rendition I left a tiny bit of texture to the ground almonds so that they would have a little toothsome mouth feel. The term Frangipani is used to name both the whole confection that it is filling as well as the cream itself. Here is my version of a Frangipani Apple Linzer Tart. 3 Tablespoons of cold orange juice, or water. Mix in the softened butter, egg yolk and orange juice until large crumbs form. Pull the mixture together into a ball and flatten it slightly. Wrap it tightly in plastic wrap and refrigerate for at least a half hour. You can store this up to a week in advance. 1 cup of medium-finely ground blanched organic almonds. You can also use store bought almond flour. Read the label carefully. With an electric mixer cream the softened butter and sugar together for a couple of minutes until homogeneous. Be sure to scrape down the sides after each step. Add in the flour and continue mixing. Add in the eggs one at a time and mix on a low speed. Continue mixing adding in the citrus zest or any flavoring you might like. Set aside at a cool room temperature. You will need one 10 inch or two 6 inch Linzer tart pans. Arrange the oven shelf to the middle of the oven. On a lightly floured surface, roll out the pastry to at least a 12 inch circle. Fold it loosely into quarters to make it easier to transfer to the tart pan. Center the crust in the pan, unfold and press into the pan snugly. Trim any overhanging crust from the top of the fluted edge. Place the tart pan on a baking sheet pan. Prick the bottom of the crust dough all over. Top with thinly sliced apples in a pleasing shingled pattern. Bake on the baking sheet for 15 -25 minutes until the apples look tinged with brown. 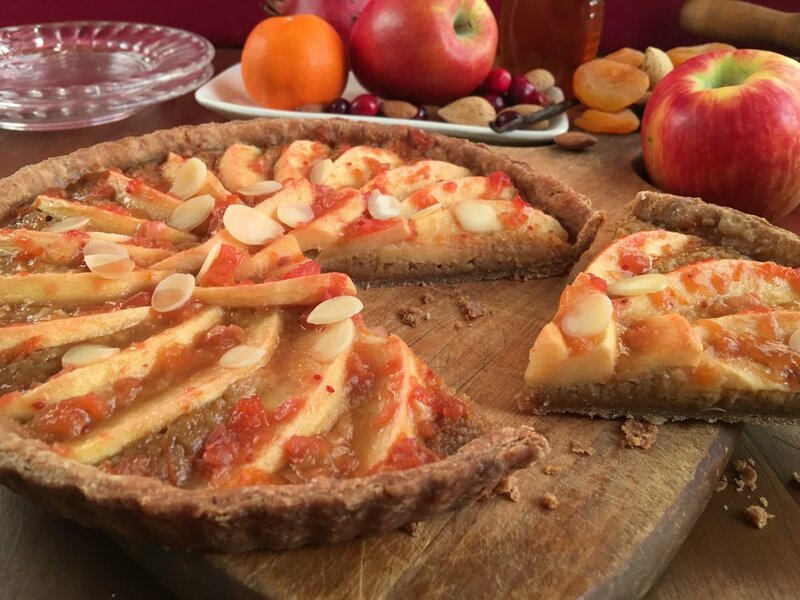 Brush the apples in the cooked tart with apricot jam. I made my own with dried apricots, golden raisins, chopped cranberries and gelatin. No sugar needed when using dried fruits. Put cold water in a two quart saucepan. Let sit for a few minutes until the gelatin plumps. Heat the water and stirring until the gelatin is completely dissolved. Add the chopped dried fruit, honey, zest and juice. Glaze the tart while hot with a pastry brush, using mostly the liquid. Re-apply when the tart is cooled for a greater sheen. These scones are crispy on the outside because of the high fat butter and fluffy in the middle because of the extra liquid of heavy cream that is made into “Butter Milk” by the addition of lemon juice to curdle it. Adjust an oven shelf to the center of the oven. Line a double thick half sheet pan (2 pans nestled together) with parchment paper. 1/2 cup (one stick) cold unsalted European style high fat (Plu Gras) butter, in small cubes. 1. Fold liquid mixture into dry mixture until just homogenous. Do not over mix! 2. Spoon or scoop ¼ cup portions of dough onto parchment paper in 5 staggered rows of 2. Lightly brush egg mixture onto scones without flattening the texture.